A New Adventure for LaCartera! 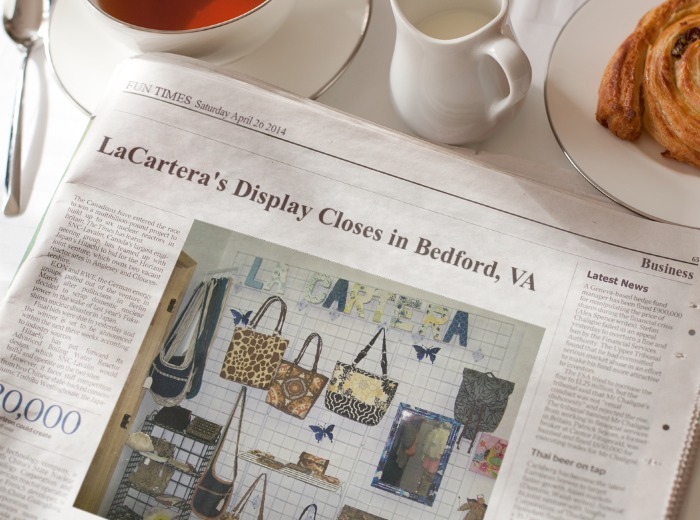 The Bedford, VA boutique closed this week, and it’s time for a new adventure for LaCartera! This is not a sad or disappointing time for me, because I gave it a try, and the location was not a good fit for my product. Since the opening of that location, I’ve sold more on Etsy, and to clients in the Washington, D.C. area. So what’s the new adventure??? Previous Post Blue Tropical Explosion – Is it a Hit or Miss? I’m excited about your new adventure. Best wishes! Thank you! How is your new endeavor so far? Going great! The class completed their pencil skirts today. I gave them some free time after and one girl made a bowtie on her own. Flaws, yes, but the creativity is priceless. That’s awesome! The class sounds like so much fun. Please post some of their creations! I would love to see! Can’t wait to see what’s in store for La Catera!!! I am so sorry to hear about your boutique closing. You are so talented! You will succeed in your next adventure. ~”For every adventure ventured success is sure to succeed!”~ I have been following you since you first started. My dream is to have a business someday! Looking forward to you next. Hi Kim, I can easily accommodate the size although, I don’t have the color. A similar fabric should be easy to find. I except custom orders on Etsy that allows you to create something unique. Please Convo me on Etsy and we can discuss more details when you’re ready. Thank you so much Ali! Cute purse icons….you must share how you added them! Best wishes with your new adventure! Look forward to hearing more! Sorry things didn’t work out there, but experience learned is priceless and gives you new skills to use in future projects. Good luck. Thanks Deby! I Absolutely learned lessons….. great lessons! I don’t know if you do shows. In Richmond, twice a year, is a wonderful show called Bizarre Bazaar. All kinds of vendors show up to sell their wears and to drum up more business. It is not your average “craft” show – 10s of thousands of people visit and I for one know, lots of stuff gets bought, especially unique items like your purses. I don’t know if you have considered it, but it is really an excellent and long running, and respected venue. Just a mention. In the spring and around Thanksgiving. People come from all around to this because they know they will find interesting, unique, delicious items. People usually go for all days of the event and spend hours and dollars.